INFOGRAPHIC: Where do wild turkeys celebrate thanksgiving? Ever wonder where turkeys lucky enough to survive Thanksgiving can be found? Trulia set out to find the answer by looking at the annual USGS Breeding Bird Survey. If you’d like to find a turkey someplace other than the dinner table on Thanksgiving, the best place in the US, statistically speaking, is Roger Mills, Oklahoma. It averaged over 28 wild turkeys counted during the USGS 2.5-hour survey period. 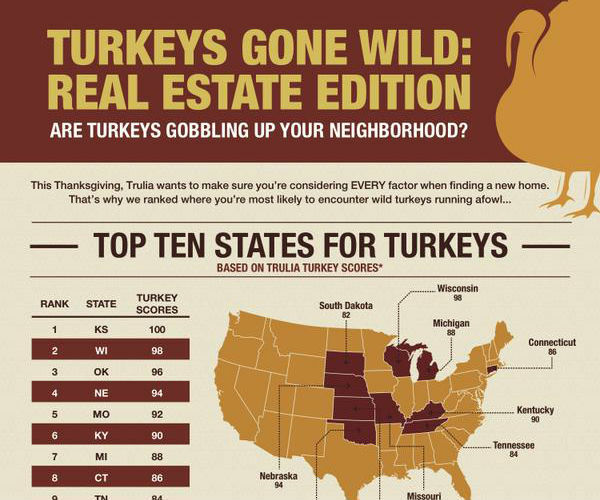 In fact, counties in Oklahoma and Kansas stuffed the top 10 list of the most turkey-populated places in the U.S., according to Trulia. Among states, Kansas seems to have more turkeys than any place else. Over 10 years, an average of nearly 3.2 gobblers was sighted along all survey routes in the Sunflower State during the survey periods, compared with 2.3 in runner-up Wisconsin. 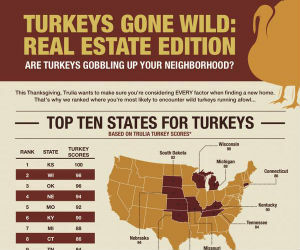 In fact, all but one of the top 10 turkey states are outside the US heartland – Connecticut, according to Trulia.